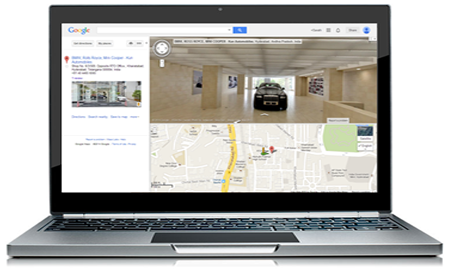 Show your full infrastructure and Location to your Customers through Google Search, Google Maps and Google+. Google Business photos take traditional photographs to the next level. The online virtual tours comprise of photos taken by photographers trained and certified by Google. Their still photographs are incorporated into 360-degree views using panoramic camera technology. Our trained and certified photographer will come to your business and take a series of tour images throughout , starting from the exterior, working through the premises. We would like to capture your business on a normal working day but by all means have a tidy up before the photographer arrives. Google Business View was launched in Jan. of 2012. It has become an important element that Google offers to highlight your business and impact search results. "A picture paints a thousand words." Making your business easily findable on any Google search and grabbing the attention of potential customers (whether or not you have a website). Showcasing the unique features of your individual business to a wide audience and encouraging more customers to visit. Helping you to stand out from your competitors, easy to embed into websites and share on social media. Now business owners have a reliable partner to highlight their businesses around the world with a virtual 360 degree tour from .